The Electrical Connection is your doorway to Eastern Missouri’s finest team of reliable electricians and quality electrical contractors – always ready to perform your electrical construction, maintenance and service. The Electrical Connection combines the capabilities, resources and commitment of the St. Louis Chapter, National Electrical Contractors Association (NECA) and the International Brotherhood of Electrical Workers (IBEW) Local One to offer the ultimate in value and safety to you – whether for your home, business, facility or plant. We give you access to more than 100 licensed electrical contractors and 2,500-plus thoroughly trained electricians and communication technicians. Behind the walls, above the ceilings and in the floors, electrical and data wiring run unseen and unnoticed – unless there is a problem. Electrical and data construction need to be done right – the first time – because fixing problems behind walls and above ceilings can be more expensive than initial installation costs. Work completed right the first time or it’s fixed for free. 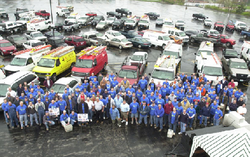 Electrical Connection is not only a not-for-profit partnership between electrical contractors and union workers, it is a partnership between the electrical industry and the community. Through Electrical Connections, contractors and IBEW have provided tens of thousands of dollars of free services to organizations like Habitat for Humanity. It has brought people together to do free safety upgrades in the homes of our elderly citizens and donated funds civic organizations. Electrical Connections has also taken a leading role in the economic development of Eastern Missouri and beyond. It understand that a healthy future for our children will require clean and renewable sources of energy as well as economic opportunity for everybody. Electrical Connection has chosen to confront the problems of the future with commitment, contribution and partnership rather than add to the contention that so often makes its way into the headlines of our newspapers. Partnership is the road to prosperity for all and Electrical Connection not only seeks to do this in our industry, but in our communities as well.